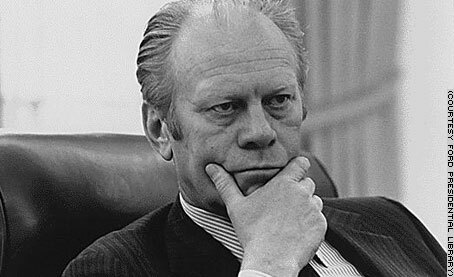 Everyone remembers that Richard Nixon commuted the sentence of Jimmy Hoffa, but few people remember that Gerald Ford pardoned Teamster legend David Beck. Beck once entertained the idea of going to law school. And he later observed that, given his numerous courtroom appearances, such training “would have come in handy.” But, instead, the path of the high school dropout’s life seemed to be set on December 1, 1924, when he was elected secretary to a Laundry Driver’s Union. Shortly thereafter, Beck attended his first meeting of the International Brotherhood of Teamsters and was given a five hundred dollar a month job as part-time general “organizer.” He then became a full-time “organizer” for the Pacific Northwest and British Columbia. In 1937, Beck was made chief Teamster organizer for the West Coast and increased membership from four hundred to over one hundred thousand. He worked tirelessly to get his organization to the point where it could “launch a fight in every nook and corner of the eleven western states.” He also managed his own public image by assisting in war loan drives, blood donation campaigns, church fund raisers, and contributing to the Associated Boys Club and the YMCA. Beck eventually sat on the state parole board and the Seattle Civil Service Commission as well as the University of Washington Board of Regent’s. In 1948, Beck was made Executive-Vice President of the International Brotherhood of Teamsters. He was selected to be President of Teamsters in 1952. Beck would soon be on the front page of national newspapers. He would meet and pose for pictures with the President of the United States. The days of driving laundry trucks must have seemed a million years away. In August of 1956, a reporter for Look magazine met with Senator John F. Kennedy to discuss a possible investigation of Teamsters. The following November, five weeks after Beck praised the Republican administration of Dwight Eisenhower, Senator Kennedy began calling Teamster offices and seeking interviews. In January of 1957, Beck and Robert F. Kennedy squared off, face-to-face, in a hotel room of the Waldorf-Aastoria. The meeting lasted for an hour and half. Kennedy informed Beck there would be congressional hearings and that Beck would be accused of misusing Teamster’s funds. But, in the late 1950's, a Washington state court found him guilty of embezzlement and a federal court found him guilty on four counts of income tax evasion and two counts of falsifying union tax forms. Beck was eventually sentenced to five years in prison and received a good scolding from Judge George Boldt (who was impressed by Beck's "insatiable greed"). Beck's response to the reprimand was indicative: “I am not the first innocent person to be sentenced, nor will I be the last.” Beck, now replaced by Jimmy Hoffa, entered prison on June 20, 1962. He later referred to his time on McNeil Island as a “vacation” that may have actually added ten years to his life. An appeal reduced his original sentence by half, so he left prison December 11, 1964. Robert Kennedy met with Dave Beck at the Waldorf Astoria, not John Kennedy.